TCRN role: Professor David Goldstein is the Director of the Translational Cancer Research Network (TCRN) at UNSW. In this role he brings together expertise across cancer research and clinical practice domains, delivering infrastructure and research enablers to support the clinical, educational and research endeavours of TCRN members and partners. 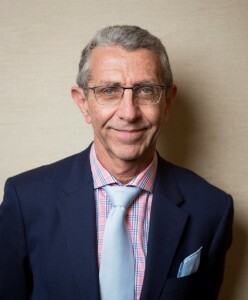 Professional and research interests: Professor Goldstein is a conjoint clinical professor at the Prince of Wales Clinical School, UNSW and a senior staff specialist in the Department of Medical Oncology at Prince of Wales Hospital. His research is focused on novel therapeutics trials and clinical research into pancreatic cancer, gastrointestinal stromal tumours and renal cell carcinoma; and on the psychosocial aspects of cancer care. Career achievements: Professor Goldstein has received more than $19million in peer-reviewed funding as a chief investigator since 2010 and $10million as CIA, and has produced 235 peer-reviewed publications with 6657 Scopus citations. He recently received the Professor Rob Sutherland AO Make A Difference Award in 2017. He was the treasurer of the AGITG until 2016 and was on the first executive board of COSA from 2013-2015, and was a founding member of the NSW Pancreatic Cancer Network. He is also the recipient of the Gold Maryalyan Award for services to COSA and the Vietnam Peoples Health Medal for contributions to improving cancer services to in Hue, Vietnam.